In the foothills of the Outeniqua Mountains in Blanco George on the Garden Route, Malvern Manor Country House is set on a 50-acre country estate, part of a small dairy farm. Spectacular views and tranquil surroundings. 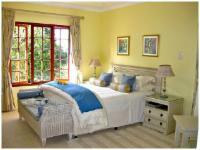 The Cape Dutch Manor house offers luxurious accommodation, friendly service with attention to detail. Breakfasts are cooked to order. The team at Malvern so love hosting Portfolio guests that they're offering a special not available anywhere else. Stays 3 nights and get a 4th night free! Valid for 2 people sharing til end of April 2019 - mention 4 for 3 when booking with our res team. "We enjoyed the stay at M M very much, very friendly and helpful hosts "
"We had a delightful stay at Malvern Manor Country House. Our hosts were delightful. The service was excellent. The room very comfortable. The breakfast was delicious. The gardens and views were lovely and the swimming pool most enticing." "My girls and I had a wonderful, restful and refreshing time at Malvern. It is a best place to go if you want to recharge and relax. The hosts were also good and welcoming. Thank you." "We very much enjoyed staying at Malvern Manor. 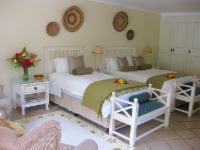 The house and gardens are attractive and the rooms are well-equipped and comfortable. The owners, Michael and Sandra, are exceptionally helpful and welcoming." "very nice,cute apartments, big bathroom, lovely breakfast, near to the Golf Grounds of Fancourt and George Golf Club, interesting conversation, distinguished information"
"First class - excellent room and food - in a lovely setting. Very friendly and helpful and made us feel extremely welcome. Just like home from home." Take the George Airport exit, onto the R404 to Oudtshoorn. Enter Montagu Street and pass Fancourt Golf Estate on the right, 500m on the left turn into Napier Street, at the top of Napier Street turn left into Searl Street and then right into Boshoff Street and travel for 1,2 km. Malvern Manor will be on the right.